Another day, another DB2 quiz. Below is the partial output produced by a DB2 tool. Which tool is it? It is part of every DB2 LUW installation. In an earlier blog post I had written about why Workload Management is needed. It's not just something for the database system or on the operating system level, it is really useful and done in "real life". But what is managed in the system, how are you able to identify activies in a DB2 database system? I am going to explain that today. Before I dig deeper into the identification, first we need to clarify what is meant with "activity". It could be almost anything going on in the database system that is related to a single database and could be both user- and system-related tasks. The important distinction is that is on the database level, not for a DB2 instance. Identification of activities deals with three questions: WHO is doing WHAT on my database and WHERE is that data located? Who is the user and which group does the user belong to? Is the user operating in a special role? From where is the user connecting, does the machine have a name, is it from a specific application? In DB2 these properties can be checked and used for identification of an activity by defining a workload (CREATE WORKLOAD). The workload object deals with the WHO. The WHAT and WHERE aspect of identification are handled by work classes. They are defined as part of a so-called work class set (CREATE WORK CLASS SET). Each work class can be used to identify an activity based on the type of work it is performing on the database and its related costs (the WHAT part). The type of work could be any combination of LOADing data, defining, altering or dropping objects (DDL), or read or write operations as part of select, insert, update, and delete statements (DML). The cost is what has been estimated by the DB2 compiler/optimizer and is the expected overall execution cost (timeron cost) or the cardinality (how many rows are we expecting in the result). Note that the actual cost of an activity is dealt with as part of controlling and managing the activities which I plan to describe in a later article. By specifying a "data tag" for a work class, it can be related to storage groups or tablespaces and their priority. This is how activity can be identified by from WHERE the data is processed. Because multiple work classes in a work class set could identify the same activity, the individual work classes can be ordered/positioned within the set. That way a work class with several properties could pick a very specific activity whereas other activities would be mapped to more general work classes. Using the concepts of WORKLOAD and WORK CLASS SET it is possible to identify an activity. They help to understand what is going on in the DB2 database system. It is the prerequisite for actively controlling and managing the activities in the system by assigning resources. What does it say to the trained eyes? Where was screenshot taken, what does it indicate? Any takers? The first step is the hardware setup. Connecting the pins of infrared motion sensor to 5V, ground, and an IO port on the Rasperry, and then the webcam to the USB port is simple. The mini-computer already has LAN access which is important to access the Cloud services. Next I logged into IBM Bluemix, the platform-as-a-service (PaaS) offering for developers and created a Cloudant data store. 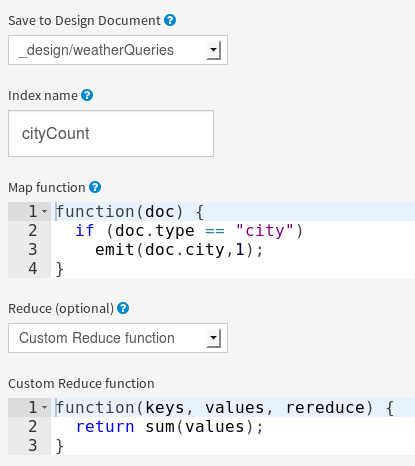 This is done similar to how I described it in my previous article on using Cloudant for some statistics for a weather webpage. The account data for the Cloudant database can be obtained in JSON format. I copied that information into a file "cloudant.json" and placed it into my project directory on the Raspberry Pi. With that, we are already at the software part of this project. Once some motion has been detected, the Python script invokes a shell script. It is printed below. 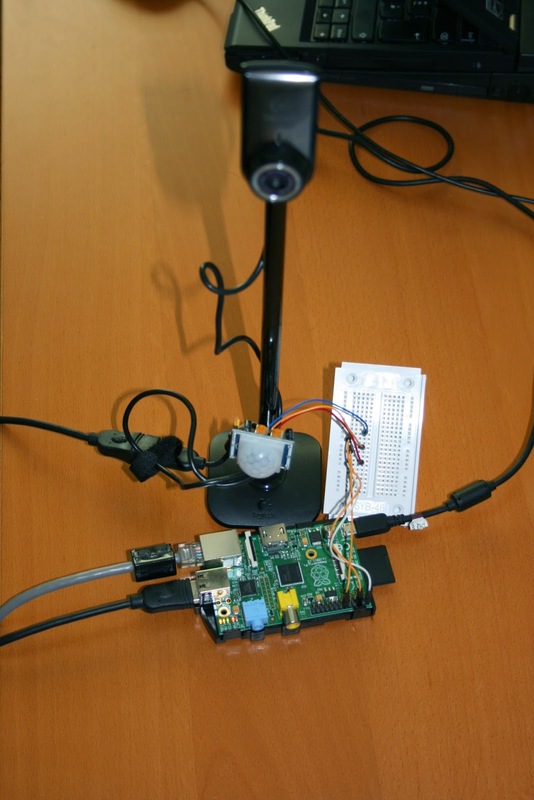 The only action is to execute the fswebcam program which takes a snapshot with the webcam. Thereafter, back in Python, I create a JSON document, stuff the current timestamp and some other information into it and store it to the Cloud-based NoSQL database. 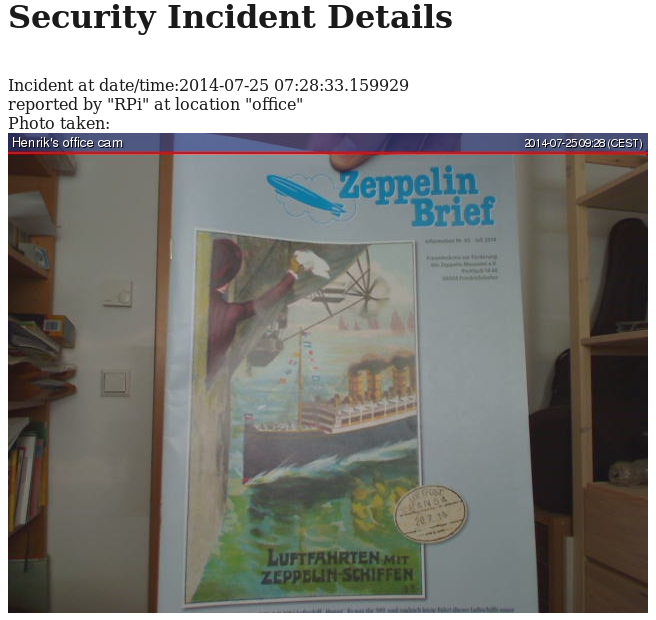 As last step I attach the picture to that document, so that even if the mean chocolate thief notices the trap, the image is secured in the cloud. With that I am done with the Raspberry Pi. What is left is to work on the reporting. 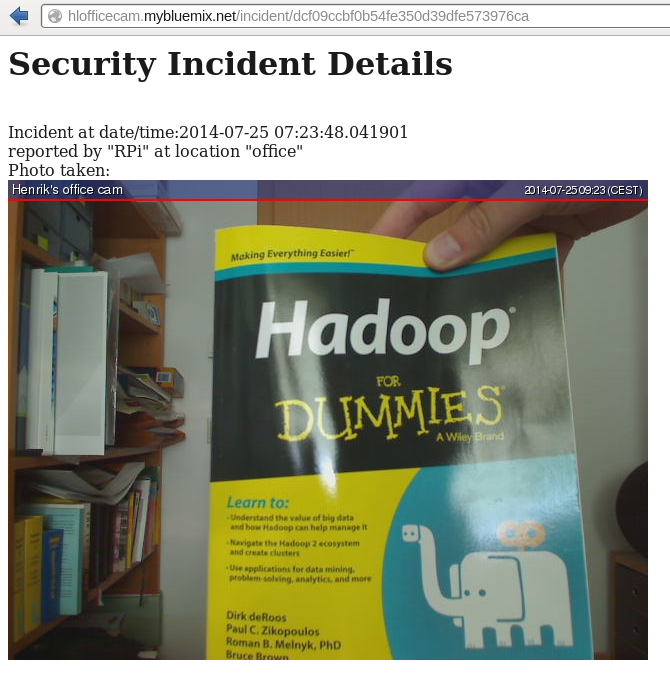 See how it is done in Python on Bluemix and Cloudant. In today's DB2 quiz the focus is on DB2 processes and CPU consumption. Which SQL statement did I run in DB2 for the following output? What function is used? A statement similar to the one I used can be found in the DB2 Knowledge Center. The statement makes use of a special table function. 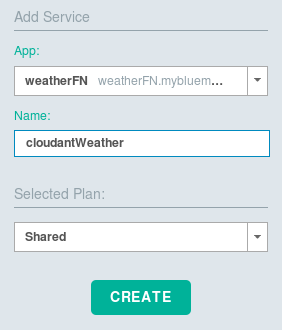 Last week I played with IBM Bluemix, Python, and JSON to deploy a (very) simple weather application. Now, as an enhancement, I wanted to use my own subdomain for that app. I succeeded, here is how. One of my own domains is "4loeser.net" which I use, e.g., for this blog. 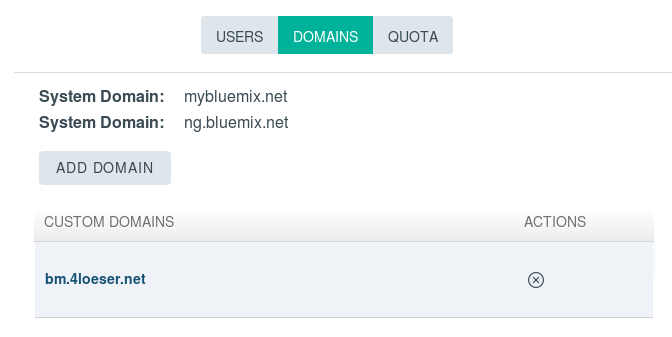 To avoid collisions with some other services linked to this domain, I created a subdomain "bm" (as in BlueMix). 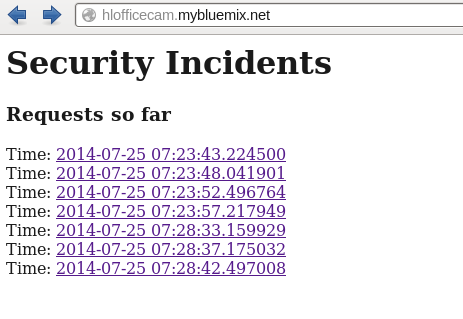 Next I added a CNAME entry to route all requests for "bm.4loeser.net" to "mybluemix.net". That was the easy part. The next is more complex because it requires two simple steps, not just one. 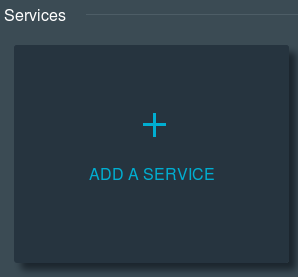 In my Bluemix account I have to click on my email address in the upper right corner. The pulldown menu has an entry "Manage Organizations". Then, in the admin panel, you select "domains" and add your custom domain. That brings up a panel where you can define the routes to your application. 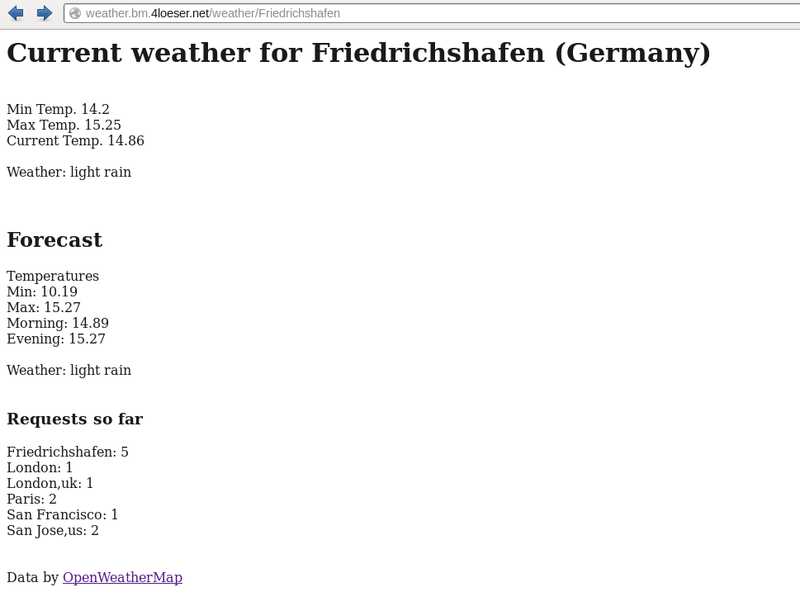 In my case I added http://weather.bm.4loeser.net as a second option. I could have removed the mybluemix-based route. What is left is some testing and writing up my experience. Done. Update: There is a follow-up article describing how I added a Cloudant / couchDB database to my Python application on Bluemix.